(1) Waterproof steel frame bundle with each end capped; (2) Steel frame case sealed by plywoods with each end capped. Ex-work within 5 weeks after order. For high, middle, low pressure boiler and pressure purpose. Chemical Composition Inspection,Mechanical Properties Test. Surface and Dimension Test, Non-destructive Test, Hydrostatic Test. Tube OD: 51 mm max. Square or Rectangular Fins are welded on 2 steel base tubeS. We call it HH or Doule H Fin Type Tubing. Approved drawing and the delivery conditions (TDC) of clients. Tube swaging, elbows, bends (90° / 180° or as per client's design). The Square or Rectangualr H Finned Tube quality is assured by hydrostatic or pneumatic tests, eddy current tests and tensile tests in order to verify the mechanical bonding between inner tubes and outer fins. Outside-Red oxide zinc phosphate primer and inside volatile corrosion inhibitor (VCI) in water soluble tablet form. Delivery Condition: Tube ends are square cut, free burrs, internally dried and air blown clean, externally coated with varnish at both ends of Square or Rectangualr Fin Tube. 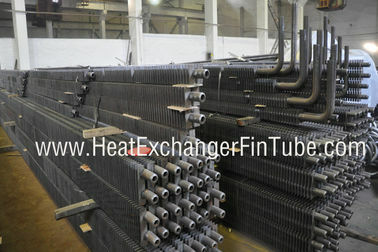 Why we choose HH welding fin tube: High efficiency, minimum power loss, easy cleaning. We have more than 10,000 square meters workshop, including 6 H-FIN TYPE finning machines, daily extrusion capacity up to 20 tons. The Square or Rectangular Fins H-Finned Tubes are the preferred tube choice for high pressure boilers. Fins can be manufactured by stamping process in almost any shape and size. In-line fin and tube spacing allows for cleaning with excellent choice in sooting or fouling atmospheres. Fin height and spacing are limited only by heat transfer considerations. Fins and tubing can be similar or dissimilar metals.